Headed down to OBX late Friday afternoon and arrived just after the power outage which had the entire Island and Manteo in the dark. It was a little tricky navigating without stoplights in the darkness but I soon found my way safely to the Howell home and within minutes the power was restored. Enjoyed a very relaxing and beautiful day on Saturday with temps in the 60's including breakfast with the Werners, a visit to the Surrette campsite and a short run. Everything was looking perfect for a great day of racing. Up in time Sunday morning for the short drive to get on the shuttle and then a few minutes over to the start from there. I met up with Karla and Amy was along in a few minutes while we visited with some other friends before making our way over to the starting corral. 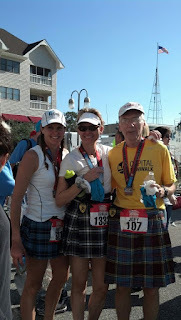 All three of us were wearing our kilts at Amy's suggestion which sounded like a good idea since we had planned to run together as much as possible. We got off to a good start , just trying to stay relaxed and not get caught up in the excitement and stick to the pacing plan. Amy got a little ahead of us in traffic but we caught up right at the mile mark which was a little faster than I had wanted but still a few seconds slower than the 4 hour pace so everything was good. Amy was having a hard time holding back and began to pull away so we just let her go and hoped she wouldn't go too fast and burn out early. By mile two we had already decided the most popular word of the day would be kilt. 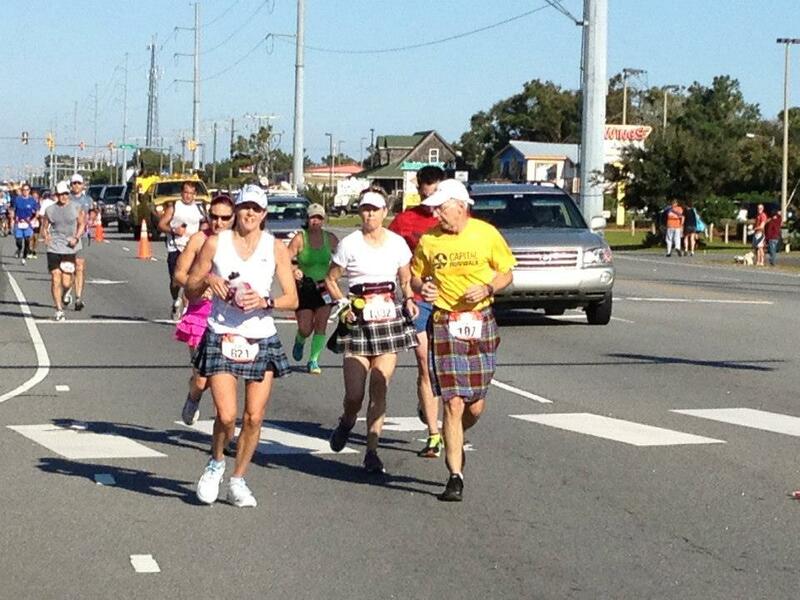 It was amazing how many comments and compliments and questions we heard about kilts and /or skirts. this would continue for the whole race. By mile 3 we were settled into about perfect pace and feeling very comfortable with it. Amy remained within sight but every now and then we would lose her as the road would turn or curve. Just past the 7 mile point on a narrow bike path that connects to the Wright Brothers Memorial we had a little excitement as a deer sprinted at top speed just in front of us and behind the runner just ahead. It would have done some serious damage if it had bumped into anyone. As we came into the open just before entering the Memorial I could see Amy about a minute ahead but then we lost sight of her. We saw her family cheering for us as we ran around the Memorial and then we headed out and towards Nags Head Woods at the 10 mile point. We passed it in about 1:30:30 which was just about perfect and was what I had hoped for minus the 30 seconds or so that it took for Karla to refill her water bottle a mile or so back. I was feeling good on the gentle rolling hills in this section and was thinking they felt easier than the past couple of times I ran here but Karla was falling back a little. I tried to keep the pace up just enough and hoped she would catch up to me. Around mile 11 I caught up to Amy. We were a little behind pace so I tried again to pick it up a bit and hope they would stay up but by 12 they were still behind a little so I stopped at a tree to take a whizz and then slowly caught back up to them. When we began the short steep climb up the single track section I took it real easy but then tried to get back up to pace but the ladies were still hanging back so I eased off the pace and let them catch back up and as we exited the Woods at mile 13 we were about 30 seconds over 4 hour pace. We were now back onto the flat roads which was a good thing except it was getting a little warm and there is zero shade on the 2nd half of the course. The single track mile had been about 10:15 where we lost all of our cushion and then the next mile was a too slow 9:40 as we were now onto the highway. My legs were beginning to feel a bit tired but I decided to give it one more shot at getting the pace back up. I begin to push it a bit and I didn't look back hoping that the ladies would be hanging on but when I reached mile 15, I looked back and they were way behind. I had gone too fast in 8:44, hoping for 9 so I stopped and waited until Karla caught up to me. She went through it in about 9:20 and Amy was another 10 seconds back. We just plugged along around 9:20-9:30 pace for the next few miles. Amy would catch up and then fall back a bit and I was worried each time that she was going to struggle but she again showed the toughness I had admired when she first started running with us just before her first marathon several years ago. Just around the 20 mile point Amy asked if I thought she could still get a pr (sub 4:06 for her) and I figured in my head we were on about 4:05 pace so I just told her, yes, but she couldn't slow down. At that she slowly begin to pull ahead of us. Karla and I continued on slowling few seconds each mile but still moving well. Around mile 22 I stopped for a gel and ran to catch back up to Karla but just after I pulled up beside her , my stomach felt a little sick and I felt as if all the energy drained from me. I told her I was going to have to let her go and I begin to walk. It was very frustrating to see her pull away. I had really hoped to finish with her and just a mile back I felt confident that I would. I ran again until halfway up the bridge and then walked to the top. Running down the other side I felt a resurgence and was moving at a decent pace and for a moment I thought I may actually catch back up to her but as soon as I hit level ground again the pace once again slowed and from that point on I just did a run/walk to the finish. At this point there was no need to make it any harder than necessary. I finally made it to the finish in 4:14:23. Karla had slowed a little but still made it in around 4:09 which is her fastest time in her 7 years on this course. Amy not only didn't slow down but ran a strong finish and got the pr in sub 4:05. Although my time and especially not finishing with Karla was disappointing , I still enjoyed a wonderful weekend of friends and running. I can't say the result was unexpected. I imagine my body was still tired from the 84.5 mile beating I inflicted on it at Oil Creek 4 weeks ago and I had put in some pretty big miles in training since then. This one was for fun anyway but now the speedwork phase of training for the BQ attempt next March begins after some recovery time this week. Oh, and in the meantime along with the speedwork, I still have a 50k after Thanksgiving and a 50 mile PR attempt in January. Stay tuned. It may be interesting.